This Christmas season, families everywhere will be enjoying time together, creating new memories and building relationships. For many of the men and women of our military, however, Christmas will be spent far from the comfort of home and the love of family. These dedicated men and women will sacrifice their own Christmas memories in order to ensure the safety and security of everyone else. How can you say thanks for this gift? Military Christmas ornaments provide you with the best possible way to show that you care. Do you have a spouse in the military? Whether you are lucky enough to spend Christmas together or are spending the holiday a world apart, a special Christmas ornament is a fantastic way to show your husband or wife how proud you are and how much you respect what he or she is doing to protect your family. Is your child in the military? If so, you can give him or her a personalized military ornament that will show your love and respect while also providing a keepsake that will commemorate his or her military service for years to come. Imagine the pride your grandchildren will feel each year as they hang the special ornament that marks the military service their mom or dad performed. Military Christmas ornaments are also a caring, thoughtful way to help someone honor the loss of loved one who fell in combat. There are many wonderful, personalized ornaments that provide a picture frame for displaying a photo of a fallen hero. These commemorative ornaments will be treasured by the fallen soldier’s family for years and will make sure the lost loved one always holds a place of honor during the holidays. 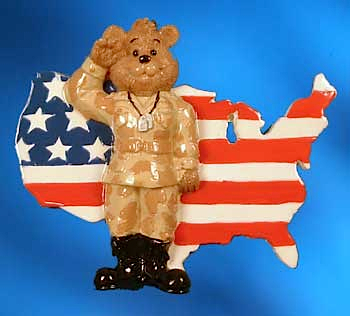 Finally, military ornaments are an excellent choice for sending gifts to any soldier. Every Christmas, many families send gift packages addressed to any soldier serving overseas. While packing a variety of snacks, toiletries, and other much-needed items, why not include a beautiful military ornament to make the thoughtful gift even more special? The lucky recipient of your package will love the care and thought of the ornament and will have something special to send home to his or her own family. There are so many dedicated military men and women who deserve appreciation and respect. Why not show that you admire their sacrifice by giving personalized military Christmas ornaments? There are so many beautiful ornaments available that you are sure to find one that is simply perfect, regardless of whether you are buying for a spouse, a child, a stranger, or to commemorate the loss of a fallen soldier. 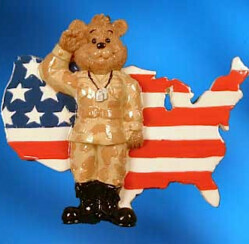 OrnamentsWithLove.com has a unique and memorable collection of military christmas ornaments.